Across the Midwest and the Northeast, crews have been working to restore power to those who lost it during last weekend's massive ice storm. NBC News' Kevin Tibbles reports. Tens of thousands in the Northeast, the Midwest and eastern Canada who spent Christmas in the dark and cold after a vicious ice storm are likely to be waiting until the weekend for power — just as fresh snowfall is expected to complicate restoration efforts, utility firms said Thursday. People in Maine — proportionally the hardest-hit state — will see a second bout of snow drop 3 to 7 inches before the storm moves off the coast Thursday night, forecasters said. Cold temperatures also are threatening to plunge more people into darkness. More than 200,000 people — about half in Canada and 54,000 of those in Toronto — were still off the grid Thursday after the winter storm covered huge areas in several inches of ice, downing trees and power lines. The new snow is creating havoc for utilities hustling to restore power. "There was some concern expressed over the last couple of days about that storm coming because obviously we still have lot of stuff weighing down trees and lines," said Susan Faloon, a spokeswoman for Bangor Hydro Electric in Maine. "The system is pretty compromised out there," she added. "We expect we will have more outages." 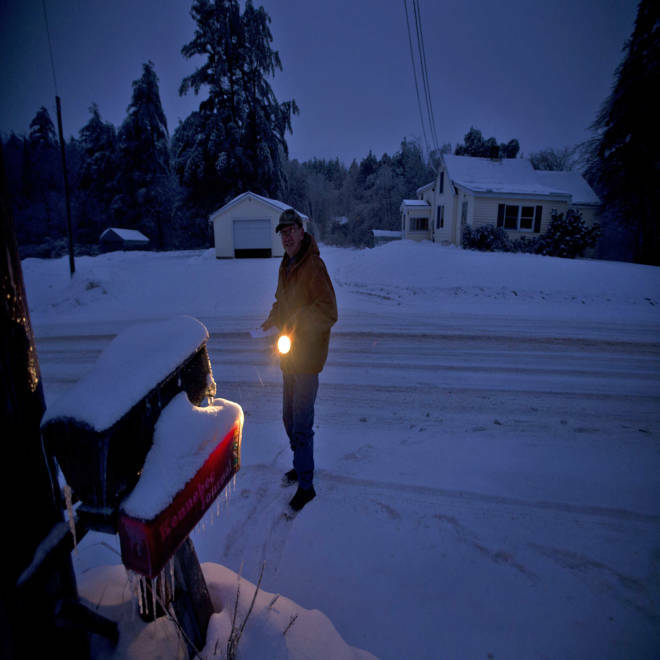 Jim Ridley uses a flashlight to get his mail Thursday in Litchfield, Maine, where he has been without electricity since Monday's ice storm. Consumers Energy, which provides power to parts of Michigan, told NBC News on Thursday that it had been the worst winter weather in the week of Christmas in the company's 126-year history. "Mother Nature has not been kind to us," spokeswoman Debra Dodd said. The firm was working 24 hours a day and had drafted line workers from 11 other states, she said. Despite having restored power to 25,000 customers on Christmas Day, Consumers Energy still had about 73,500 outages Thursday afternoon. Other companies accounted for about 15,000 outages in Michigan. In Owosso, Mich., 8-year-old Shyann Decator was able to stay positive despite spending Christmas Day in a Salvation Army shelter with her mother, Mandy Fisher. It was "overwhelming at first a little bit not knowing if we could go home for Christmas," Fisher told NBC station WEYI of Flint. "But we've been taken care of." Eric Sheffer, left, and Matt Adams reconnect a power line Thursday in East Lansing, Mich.
At another Red Cross Shelter in Middleville, Mich., people without power in their homes were also making the best of the situation, said the Rev. Tony Shumaker, whose church, Snow United Methodist, dropped off meals on Christmas Eve, Christmas and Thursday. Shumaker said the 30 people who were staying at Thornapple Kellogg Middle School "were very happy." "They made a lot of new friends," Shumaker said. On Christmas, he said, "one family got their power on, went home and then came back down to eat dinner with the people that they had met." 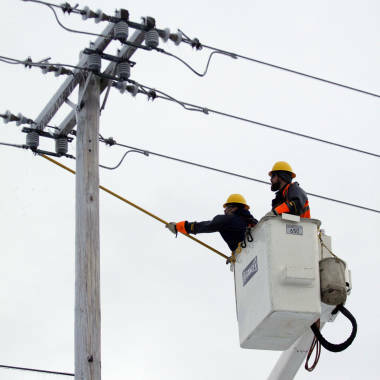 Consumers Energy said 50,000 to 60,000 customers across several counties in Michigan would be waiting until Saturday to have their power restored. Michigan was the worst affected state, with more than 91,000 customers still without power as of midday Thursday. But Maine, with a far smaller population, was hit even harder, with more than 20,000 customers still without power by Thursday night — down from 106,000 at the height of the crisis. Some people in Vermont and New York, where tens of thousands had been affected, were still waiting to be reconnected. In the snow country of New York's Tug Hill Plateau, east of Lake Ontario, 11 to 17 inches of wind-whipped lake effect snow was expected to fall by the end of the day Friday. The ice storm knocked out electricity for about 50,000 customers in northern New York; all but a handful had power back by Thursday. The continued snowfall around the region could hamper efforts to free existing lines, as well as cause new outages. Bangor Hydro Electric in Maine said some of its 11,000 outages could be waiting until at least Friday until they are all back on line. Some in Maine could still have nearly a week to wait before their lights come back on, Bangor's website said. Maine emergency officials across the state said the ice storm had created the worst conditions since the Great Ice Storm of January 1998, which left some parts of New England without power for months. Authorities blame the storm for 27 deaths: 17 in the U.S. and 10 in Canada. The deaths included five who apparently succumbed to carbon monoxide poisoning.